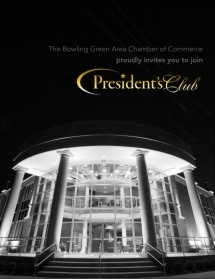 In addition to our regular Chamber partnership, we offer a President's Club partnership for those interested in investing in and supporting South Central Kentucky’s economic development strategy. The investment made by these individuals, businesses and organizations contribute to the community’s economic development efforts, business expansion opportunities and overall quality of life. These partners have a direct impact on the amount of industrial growth our region experiences. Your investment in regional economic development distinguishes your organization and complements your investment as a Chamber partner. Based on visits and consultations with you, the Chamber recently redesigned our benefits package to be more relevant, distinctive, flexible and valuable to you. We welcome you to actively use all the special benefits and privileges we have designed in appreciation of your leadership investments in regional development and continued prosperity. Thank you for your investment in the economic prosperity of the region. For more information on the benefits and privileges offered to President's Club partners, click here. To join this prestigious group, contact Vice President of Partnership Services, Maureen Carpenter, at maureen@bgchamber.com or 270-901-4614.